Capelin, also known as Mallotus villosus, are a small fish which play a vital role in providing the link between plankton and larger animals. They spend the majority of their lives offshore and only move in to the Newfoundland shores for spawning. 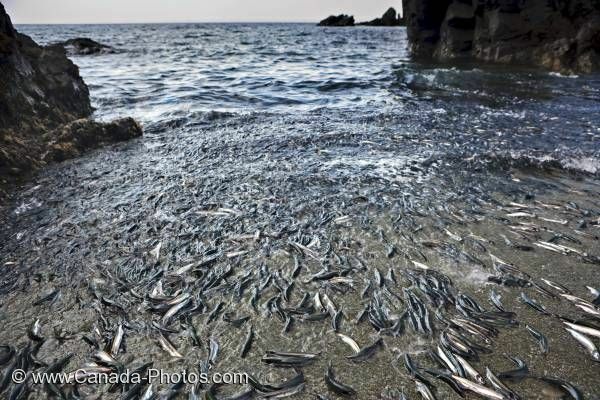 Spawning Capelin, Mallotus villosus, on a beach at Admiral's Point, Bonavista Peninsula, Trinity Bay, Highway 239, Discovery Trail, Newfoundland, Newfoundland Labrador, Canada.